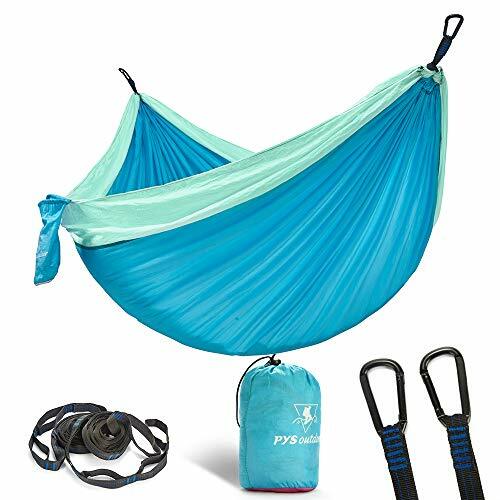 PYS Double Camping Hammock for Backpacking and Hiking! This hammock is made from 210T nylon parachute material,it's versatile, durable, and compact, making it perfect for camping, hiking, or lounging around with a friend. 1 x HAMMOCK : Our hammock is two person size hammock.It's large and feels soft and comfortable! We have employed triple interlocked stitches to maximize hammock strength for your ultimate safety.The hammock is also equipped with reinforced nylon straps at either end to prevent ripping or tearing! Lightweight and compact.So it's can be easily into attached storage bag. Packed Dimensions: (L x W) 10" x 4.7", Unfolded Dimensions: (L x W) 118" x 78". 2 x TREE STRAPS : Our hammock set contains two tree friendly straps, it could protect tree and avoid the damage caused by straps.The many loops in the strap allow you to adjust the length of the strap just by using your carabiner, giving you a perfect hammock hang in no time! Packed in a car or backpack for a weekend camping trip! 2 x CARABINERS : It's lightweight (0.49 ounces)and high capacity,rated up to full 1200 lbs.The edge of Carabiners are flat and smooth, but others are sharp. The sharp edges may snag your hammock or ropes. Available Exclusively Coupons on Amazon! VIEW OUR PYS OUTDOOR PRODUCT MORE: Hammock, Rain Fly, Bug Net, Hammock Tree Straps, Swing Straps, Trekking Poles, etc. COMFORTABLE AND EXTRA LARGE: XL PYS outdoor double camping parachute hammock made from 210T nylon tear-resistant breathable material, and breaking to 1200 lbs. Best choice for two person size grand trunk hammock for sleeping give you more room stretch out, nap or snuggle someone! TREE STRAPS & CARABINRES ACCESSORIES INCLUDE: This portable folding hammock comes to go with two 108inch lengths of premium ultra-strong tree straps and two heavy duty&smooth carabiners. The hammock is also equipped with reinforced nylon straps at either end to prevent ripping or tearing! PERFECT FOR OUTDOORS: With the PYS lightweight outdoor camping hammock, you can go adventuring outdoor! It is lightweight-coming in at 1.9lbs, and folds down to a compact size, so it can easily be packed in a car or backpack for camping hanging trip! EASY SET AND HANGING OUTFITTERS: This outdoor travel hammock can be used anywhere&anytime where there's a place to hang it. Designed to hang comfortably between two trees, posts, or poles and quick and easy to set up, so you can spend less time worrying about camp set-up and more time enjoying the beauty of your surroundings, no matter where you are! 100% SATISFACTION GUARANTEE: If you don't like your ultralight pocket hammock, or whatever, we'll instantly refund your money and you can keep the hammock, no questions asked. We provide you with a worry free shopping experience. If you have any questions about this product by pys, contact us by completing and submitting the form below. If you are looking for a specif part number, please include it with your message.